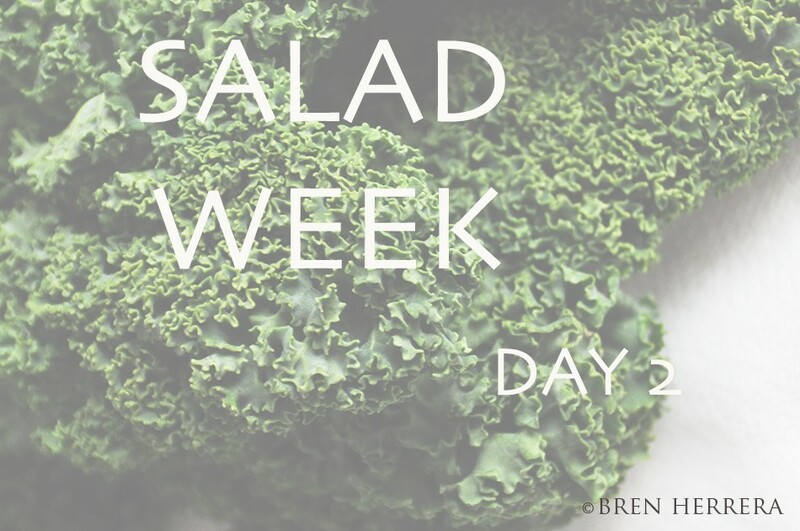 Day 2 of the Salad Week Series. These salads are going to convert me one way or the other. I wake up thinking about what I’m going to conjure up. Without getting too messy or over thinking it, I take to the fridge, pantry and go for it. Today’s ensalada was not planned. It jus happened. My partner in good, Mario, pinged me early this morning to let me know he really enjoyed yesterday’s post. He didn’t say salad; just said ‘post.’ I didn’t dig too deep to find out he was referencing a common phrase Obama uses: “Let me be clear!” It was so timely. He was also being very clear that he’d fallen off his workout circuit but was on this joyride to get back on. He pushes me to eat better when I’m down and out, calling me out when my eating choices are less than laudable. It’s now my turn to help a brother out. He wanted to know how my fresh produce inventory looked. As I listed everything out, I had a euphoric moment. I don’t think I’ve ever been so excited to make a salad. Seriously. Even the pear and bleu cheese one from two weeks ago — which is insanely doable on a daily — didn’t rock me the way this idea did. I’m a huge fan of Southwestern food… corn chowder, TexMex avocado rolls, and anything that offers great texture and flavor. I cut myself some slack from the departure of appreciating true, authentic Mexican cuisine, but if we look at the origins of Tex-Mex food, it’s not intended to mimic or replace la cocina mexicana. It’ our (Americans) interpretation of ingredients use to make food accessible to our land and culture. But in true exploratory fashion, I couldn’t stick to basic Southwestern salad — you know, the ones we can order at any of those cheesy fast food chain restaurants. I had ideas of incorporating other complementary textures and flavors. And that’s where glorious hummus entered. A refreshingly bright lemon “twist” Sabra brand hummus. And chickpeas — hummus’ foundation. This was going to be so amazing. So easy. So good. So different. The trick here was to allow the hummus to be a base. This particular flavor worked too well because of the noticeable lemon. It was too easy. And since I don’t like overdressed salads, nor do I attract most aioili options, a creamy base I could brush other ingredients into, would be great. Freshly pressure-cooked chickpeas naturally complemented the hummus, but also added a softer texture. In contrast to Romain lettuce, it was as perfect as it could get. Corn was the other expected ingredient. And the protein option was the default grilled chicken I first marinated in lemon juice. Remember, we’re going to healthier, cleaner options. It’s easy, no doubt, but I had to give you something basic because it’s about to get extra good! The red chips were very necessary. I need a salty crunch. I could have made my own, but when Trader Joes has great flaxseed tricolored chip bag for super cheap. I crumbled some on top y ahí tenemos! Where I departed is where you’re going to fall in love with this Salad Week series. This is where I miss being in my kitchen 9 hours a day, every day. But who am I kidding… I’d rather be in another country, exploring their food. But I digress. You may have thought I’d add some red onion and avocado. Even a fresh squeeze of lime, right? I wouldn’t give you a side-eye if you did. I get it. It’s what’s typically done. We’re all but typical! Let’s try something different here! Let’s be creative. Undressed salads work for me. And when they are by some glossed over request to omit, I have to be fully engaged in the makings of a dressing. It’s the one thing that could highlight or dull out a fantastic meal. An avocado oil and cilantro aioli with a kick of heat brought on by raw red onions and a splash of chipotle hot sauce will make you cave. Just be careful. The salad’s touch of glory is reserved for this bottle of goodness! Drizzle it over the hummus brushing and see what happens. I’ll let you experience it. Have fun with it. Think outside the box. You really don’t have to go to those muy caliente all-American restaurants to enjoy some Southwestern food with a good dose of global flare. That hummus. Don’t forget that hummus. 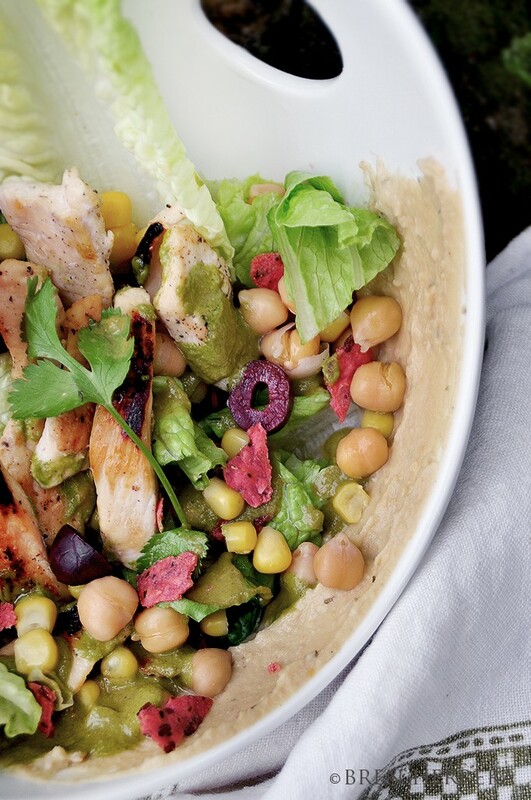 For without, you’ll end up with a basic grilled chicken salad. Dip those sun dried tomato flaxseed tortilla chips into it. I hope you enjoy this one and come back every day this week at 4pm EST for more! 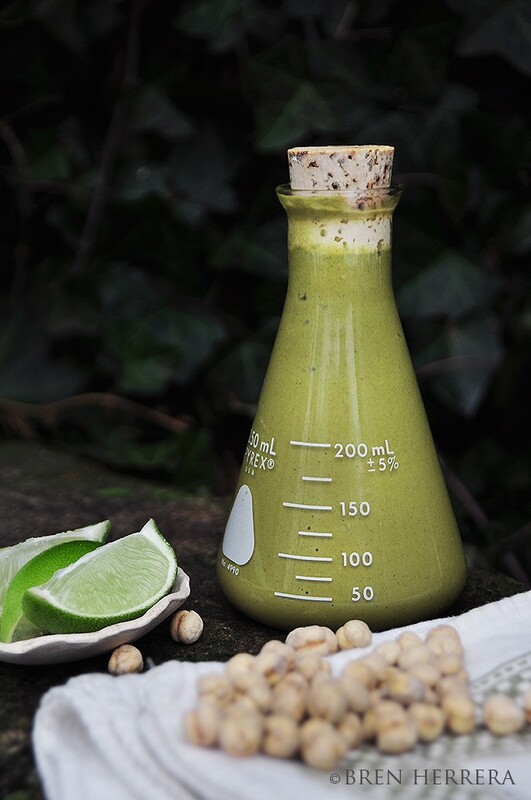 Cheers to eating better, cleaner, and leaner! More anecdotes later. 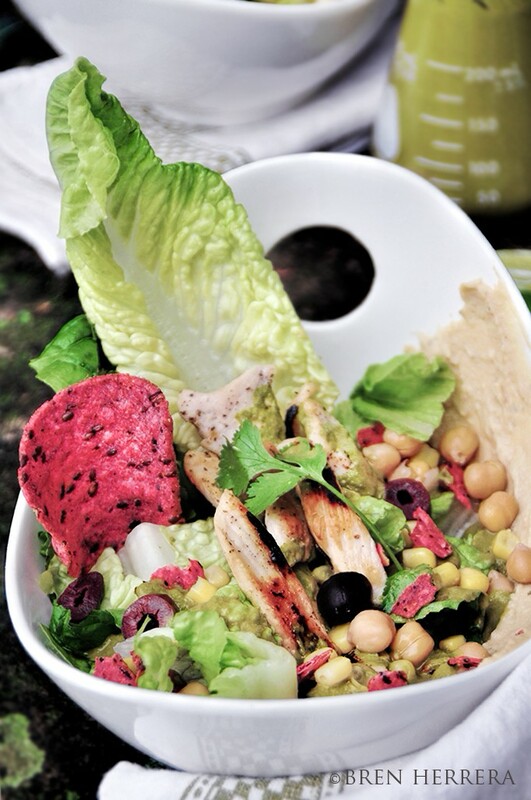 Using a spatula, brush a generous amount of hummus on the side of bowl. Place one large romaine stack on opposite side, anchoring it in hummus. Stack salad as you wish, leaving dressing for last. Garnish with cilantro. In food processor, add cilantro, red onion, avocado oil, salt, lime juice and hot sauce. Pulse well until you have smooth and creamy dressing. Refrigerate. Ooooh, Bren! This looks and sounds delicious! Never tried avocado oil before, so I’m anxious to run out and get some! I’ve been on a huge hummus kick lately, so this is a great digression from the usual pita or tortilla option. Will let you know how mine turns out! Thanks for Salad Week! It is good to see the yard bird make an appearance. Do you think you can come up with a salad that dressing would be optional?